Laura MacKenzie and Dáithí Sproule. Photo by Pat O'Loughlin. Used by permission of Laura MacKenzie. Matheson's songs have recently been adapted by singer and multi-instrumentalist Laura MacKenzie of Northfield, Minnesota, and are performed by MacKenzie and guests on the CD From Uig to Duluth. MacKenzie plays flutes, whistles, smallpipes, and concertina, all of which are subtle instruments. Her guests are Andrea Stern on Celtic Harp and Dáithí Sproule, one of Celtic music's most inventive and tasteful guitarists. With this palette, MacKenzie builds arrangements with a fresh, light quality, alternating between the spirited Scottish dance music of such pieces as "Chuir i glùin air a' bhodach" and the more stately feel of parlor music on tunes like "Màiri mhin mheall-shùileach." All of this perfectly suits Matheson's delicate traditional airs. Mackenzie is also the main singer on the recording, and she does an impressive job with the challenging task of singing quick, sometimes wordy Gaelic songs and making them accessible and enjoyable. 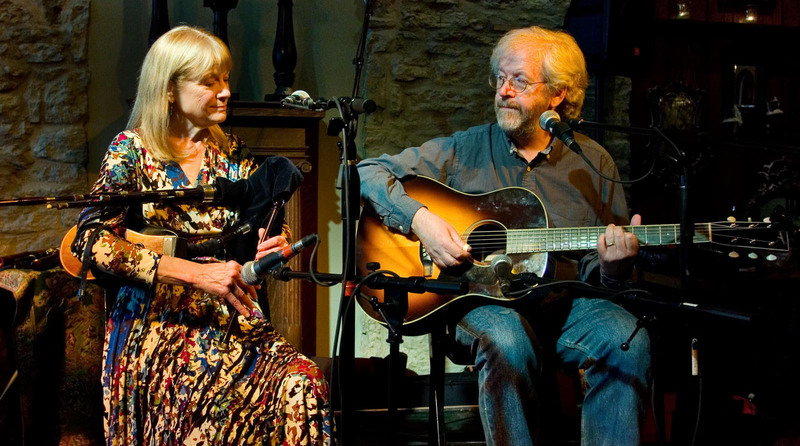 MacKenzie relies on Matheson's field recordings for most of the repertoire, so with a few notable exceptions (such as "Fear a bhatha" and "Gabhaidh sinn an rathad mor"), the tunes and songs will be fresh even to people very familiar with Scottish Gaelic music. It's a very appealing package for both general listeners and connoisseurs. Mike Katz and Alasdair White of the Battlefield Band. Photo by John Slavin. Used by permission of the Battlefield Band. 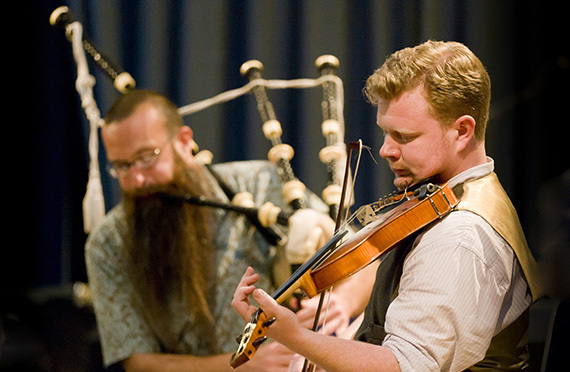 What else is new in Celtic music? Well, if you follow the scene at all, you know The Battlefield Band, which has been plying its trade since 1969. You might think that in more than 45 years they'd get set in their ways, but the band keeps reinventing itself, replacing members and musical ideas every few years. Named after a Glasgow neighborhood, they're known as a Scottish band, but often have English, Irish or American members. 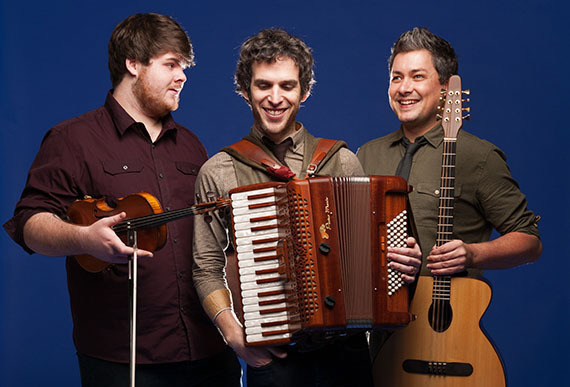 They're also usually a quartet, but recently found themselves reduced to a trio: American-born bagpiper Mike Katz (who also plays bouzouki and whistle), Irish singer-guitarist Sean O'Donnell, and Hebridean fiddler Alasdair White (who also plays tenor banjo and whistle). This makes them as much Irish and American as Scottish, essentially a pan-Celtic trio. Their creative response to this situation is Beg & Borrow, an album on which they are joined by twelve special guests, including five from Scotland, four from Ireland, one from Australia, and two from the mighty New York Irish music scene. This approach kills three birds with one stone: it emphasizes their Scottish, Irish, and diasporic roots; ensures that on most tracks they're at least a quartet; and introduces a lot of pleasing variety to the music. Beg & Borrow is big fun from start to finish. Through eighteen innovative and exhilarating tracks, the Battlefield members are at once incisive leaders and sensitive accompanists, always adding just what's needed for each song and tune. The set incorporates unusual versions of old favorites like "An Gille Mear" (which is normally an Irish Gaelic song but is here translated into Scottish Gaelic by Christine Primrose, and sung by her with Nuala Kennedy) and "The Drunken Piper" (which sounds even more drunken with Mike Whellans's bluesy harmonica). It contains original material I wasn't familiar with, like "Chief Inspector Rod Parker" (a rousing Highland pipe strathspey by their Australian guest, Barry Gray) and "Ellen's Dreams" (a beautiful harp air composed by Robin Morton and played by his wife Alison Kinnaird, a frequent Battlefield collaborator). A special shout-out goes to my New York compatriots Don Meade and Tony DeMarco, whose chromatic harmonica and fiddle, along with Morton's bodhrán, enliven a set of tunes that includes one of my favorites, "Largo's Fairy Dance," sounding suitably otherworldly on these fantastic instruments. Other driving tunes include such sterling guests as John Martin (fiddle), Leo McCann (melodeon), and Jim Kilpatrick (snare and bass drums). Lovely versions of the Robert Tannahill song "One Night in My Youth" (sung by guest Aaron Jones), "Blooming Caroline from Edinburgh Town" (sung by O'Donnell), and "Mo Bhuhachaill Dubh Donn" (sung by Primrose and Kennedy with Kinnaird backing them on harp), make this album equally pleasing for song lovers as for tuneheads. In fact, it's a great success in every category, showing that the Battlefield Band is as relevant as ever after all these years. As an occasional visitor to the Isle of Man and advocate for Manx music, I'm always happy when something from the island makes a splash in the Celtic world, and this has happened recently with Manannan's Cloak, the second CD from the youthful trio Barrule. For those not familiar with the island, it's between Britain and Ireland, and has historically been a melting pot of Irish, British, and Norse cultures. The island's Norse heritage includes the Tynwald, one of the world's oldest parliaments (by their claim, the oldest one in continuous existence), while the dominance of Scottish kings caused the island's Gaelic language to develop closer to the Scottish than the Irish variety. Since the 1970s The Isle of Man (or Ellan Vannin, as it is known in Manx) has been increasingly proud of its Manx culture, leading to a revival of the Manx Gaelic language and of Manx music. Groups like Barrule are a result of this cultural awareness, and you can tell from all the references to Manx mythology: the Manannan of the title is the Celtic sea-god after whom some say the island is named; his cloak was made of sea mist, and was one of the original "invisibility cloaks" of legend, capable of concealing the island from invaders; and his home was reputed to be the ancient Celtic ring-fort that crowns South Barrule, the hill the band is named for. But despite the ancient imagery, the band has a modern sound informed by the best of Irish, Scottish, and Breton music. Barrule: Tomás Callister, Jamie Smith, and Adam Rhodes. Photo by Simon Lees. Used by permission of Barrule.